The dutch ship yard Amels, one of the star actors in the world's superyacht scene started to build the first superyacht of Amels 171 Limited Edition in 2005. The ship yard's aim was to offer every single owner an ideal boat, and guaranteeing very much reduced delivery time. 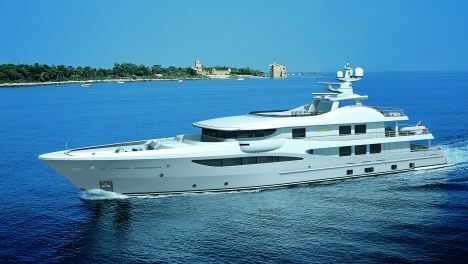 The formula adopted to ensure all this is based on a "semi custom" system, which enables the future owners to choose from materials employed to decorate, the accessories, as well as all those choices one can ask of the ship yard to maximize one's own personal taste in a pre-defined hull project. The outlining factor of this choice is that both designers and ship yard can immediately focus on the items concerning the "customization" of the superyacht itself. The Amels 171 is only the first model in what has already become the family of the Limited Edition built by the yard, has been designed by Tim Heywood who had in fact satisfied the yard's requests at the time following definite guidelines rather than the owner's. The resulting design is modern of course but never excessive, where large spaces play an important role in the shaping of the forward section of the deck based on the wide body concept, as well as the ample use of glass panelling surrounds and large open areas. A captivating design is the outcome and the considerable comfort. Laura Sessa has been responsible for the interior designs whose project foresees a large owner suite and a guest cabin on the main deck, on the lower deck two suites and a VIP suite which is divisible into two separate areas. The crew's quarters can accommodate up to thirteen so as to ensure the standards required of such a superyacht. Ample use of natural material and soft fabrics concur in rendering each area welcoming thanks also to the choice of delicate pastel colour schemes. Laura Sessa will personally supervise the interiors of each individual yacht of the Limited Edition line, to propose different possible solutions to suit every requirement. The completion of this project extended over four decks reveals a real private beach equipped with everything one could possibly want in terms of comfort as for example a large circular pool, sun bathing area, sun pads, bar, a round dining table and lots of space. The top deck also hosts another sun bathing area, that easily accommodates four chaises-longues in the forward area all of them in a privileged and discreet position. The open stern area of the top deck has room for a set of small tables and more chaises-longues. For further information contact: Amaels; Koningsweg 2; 4381 NA Vlissingen; P.O. Box 84; 4380 AB Vlissingen; The Netherlands; tel. +31 118 485002; fax +31 1118 485004; web site www.amels-holland.com; e- mail info@amels-holland.com.